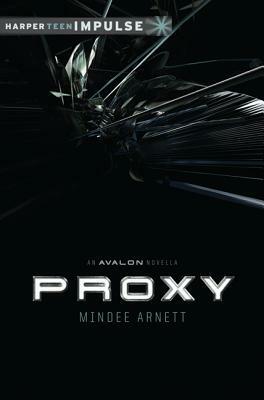 Proxy is the prequel novella to the Avalon series. I enjoyed Mindee Arnett's The Nightmare Affair and so was curious about this fairly different genre she's attempting. I've never been a big fan of sci-fi nor the space opera/futuristic types of story lines (though admittedly I have enjoyed such television series as Star Trek and Firefly, or Cowboy Bebop). The novella details one of the missions Jeth and his crew are sent on by his employer, a large criminal syndicate owned by a man named Hammer. In order to make enough money to retrieve his family's ship and home, Avalon, Jeth has no choice but to do Hammer's bidding. The crew is stealing a precious ruby from the Grakkus empire, and it seems that this job is just easy pie until someone on Jeth's crew betrays them. I'm going to say that this is the first time I've read a space opera story. Watching television series and movies and anime series seems fairly different as the action in futuristic space settings translate better to me in visual media. Nonetheless, this novella was quite enjoyable after I got through the initial few chapters of set-up and semi-world building. I can't say that it was the most exciting thing I've ever read, and the characters seem quite flat and not quite so stimulating. Everything passed by in mediocrity, though for a novella I'll give it leeway. With comparisons of this story line and the characters to that of Firefly, I may have begun to create some biases, as Firefly was an exciting, complex series with well-developed, complicated characters and an extremely entertaining story line. Not to mention the actors brought everything to life. Going into Avalon, I'm hoping that things can move upwards of the mediocre enjoyable-ness factor. After all, there's potential in a story such as this, and I'll try not to make too many comparisons to Firefly as I read it. With more room to work with, hopefully an entire book will do well to bring the characters to life and deliver an exciting story to boot.